I remember enjoying The Rozabal Line by the same author, even when a lot of readers criticized it for being too similar to the Da Vinci Code. However, The Krishna Key is less impressive, at least in my opinion. 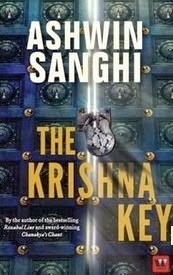 Summary: The story of four seals from an ancient civilization which along with a base plate form what is known as the Krishna Key. Each of the seals is being safeguarded by the 4 friends of Anil Varshney, who was researching the seals before he is murdered. The characters: Ravi Mohan Saini. A history professor who seems to be drawn more or less from Robert Langdon. He reads clues even before the others have had time to think about it. Priya, his helpful student, who follows him wherever he goes. Taarak Vakil: A man convinced that he is Kalki, the tenth avatar of Vishnu. Radhika: A cynical police officer investigating the murders. The writing technique: This is where the book lost points. Let me start with the repetition of various paragraphs. Every chapter of this book begins with a chapter from Krishna’s story and then proceeds to present day scenarios. It might have been better if Krishna’s story had been summarized in the preface instead of adding it in so much detail in every chapter. Then, each of the characters in the present day at some point of time, repeats the same information. For example, certain scenes from Krishna’s life are re-written line-by-line as one of the main characters’ dialogue. Another point to be noted is that, there is a lot of out-of-place dialogue. For example, there is a murder scene and the professor suddenly decides to give a history lecture. Another thing I’ve noticed is, the author tries to induce a lot of surprise in the reader. But the only indication of this are the exclamation marks placed at the end of arbitrary sentences. There is a saying, “No surprise in the writer, no surprise in the reader.” I have read books with parts that have made my heart skip a beat (one of the last scenes in Anita Nair’s Lessons in Forgetting is an excellent example). However, despite the strategically placed exclamation marks, I felt no surprise. Perhaps Mr Saini’s theory lectures during a crime scene just took the surprise out of me! The story is interesting, a one-time read. I would recommend it to those who want to know Krishna’s life story or the story of Mahabharat. But this one might disappoint fans of Dan Brown, who remains the best author of this genre.